SCHENK -[Set of 2 maps] Coeli Stellati Christiani Haemisphaerium Prius. and Coeli Stellati Christiani Haemisphaerium Posterius. SCHENK, P. / VALK, G. - [Set of 2 maps] Coeli Stellati Christiani Haemisphaerium Prius. and Coeli Stellati Christiani Haemisphaerium Posterius. [Set of 2 maps] Coeli Stellati Christiani Haemisphaerium Prius. and Coeli Stellati Christiani Haemisphaerium Posterius. 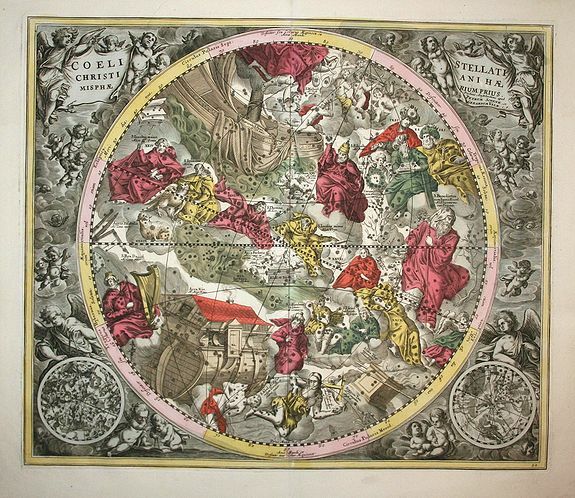 - SCHENK, P. / VALK, G.
Title : [Set of 2 maps] Coeli Stellati Christiani Haemisphaerium Prius. and Coeli Stellati Christiani Haemisphaerium Posterius..
Map maker : SCHENK, P. / VALK, G.. This stunning and uncommon set of celestial charts presents the constellations according to Christian symbolism. It is based on the work of the early 17th century astronomer, Julius Schiller, who sought to replace the traditional pagan symbols with ones derived from Judeo-Christian sources. Specifically, Schiller replaced the zodiacal constellations with the twelve apostles, the constellations north of the zodiac by figures from the New Testament and the constellations south of the zodiac by figures from the Old Testament. Instead of being projected from the pole, the map is centered on the vernal equinox and the ecliptic bisects the map instead of encircling it. On the "Prius" chart, Gemini has been replaced by James (Jacobus), son of Zebedee, Cancer by St. John, Leo by St. Thomas, Virgo by St. James (Jacobus) the Less, Libra by St. Phillip, and Scorpio by St. Bartholomew. Abraham and Isaac have replaced the constellation Centauri, Noah's Ark has fittingly taken the place of the Argonaut, and King David has replaced the constellation Canis minor. On the "Posterius" chart the constellation of Sagittarius is represented by Matthew, Aquarius by Judas Thaddeus, Pisces by Matthias, Aries by Peter, and Taurus by Andrew. Other constellations include Mary Magdalene as Cassiopeia, Joseph as Orion, and Cygnus became St. Helena, holding the cross. The river of Eridamus has been replaced by the parting of the Red Sea. Condition : In good condition. The maps are not from one atlas, the coloring is a little bit different.